Learn more about our health care classes. Classes are free of charge, but seating is limited. Please register. We strive to provide complete health & wellness care for our patients. Learn about all the services we provide. 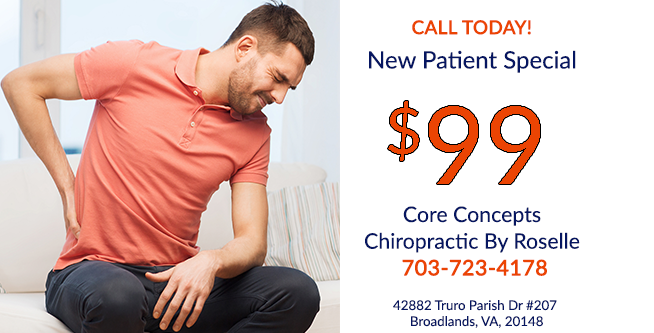 For more information or to schedule an appointment with Dr. Leonard Poe, DC, call 703-723-4178 today! Dr. Leonard Poe, DC is a Chiropractor and Applied Kinesiologist serving Broadlands, VA and surrounding areas. In practice, Dr. Poe combines the fields of Chiropractic, Applied Kinesiology, Nutrition, Acupuncture and Rehabilitative Medicine. 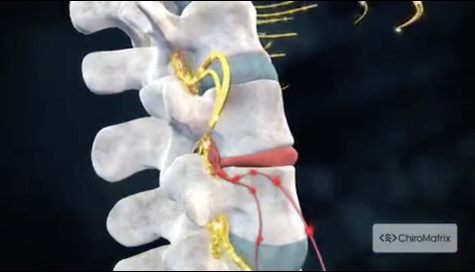 Core Concepts Chiropractic by Roselle is primarily concerned with structural, chemical and emotional imbalance in the diagnosis of health problems. If one of these factors becomes deficient or overburdened, poor dysfunctional health is the result. Treatments are developed and implemented based on this principle. Our goal is to help people achieve good health and raise their health potential naturally, without the use of medicine or surgery. Core Concepts Chiropractic by Roselle is committed to providing holistic solutions to address your unique needs. Even if you're looking to improve your overall health, we can help you attain your everyday wellness goals! Visit our testimonials page to find out what our patients are saying about our Broadlands chiropractor and our chiropractic care plans. At your first visit to Core Concepts Chiropractic by Roselle, Dr. Leonard Poe will explain how chiropractic and holistic care works and give you a full evaluation to see if our solutions are a good fit to address your needs. If there is a good fit, we can customize a plan of care for your condition and health goals. If you have not been to a chiropractor before and want to find out more, please Email Us or call 703-723-4178 to receive the answers to your questions from our experienced team. We also welcome referrals, so we invite you to share our chiropractic and wellness information with your friends and loved ones. Spring Allergies season is about to begin. Learn why we get allergies and why it seems like they are getting worse over the years. 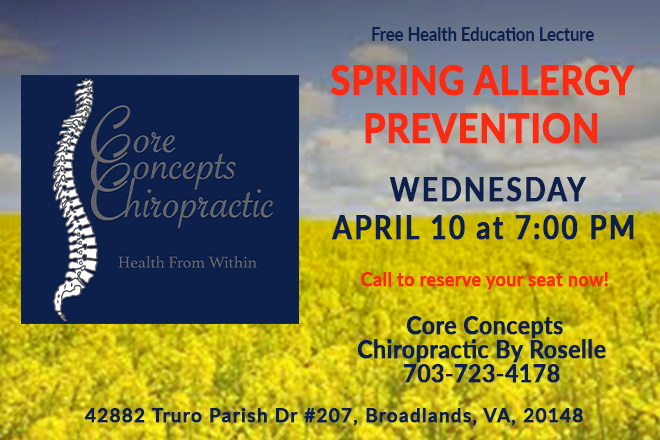 Most importantly, learn what you can do to prevent and decrease spring allergy symptoms. Join us and enter for an Essential Oil raffle at the end of the Lecture! "Wonderful doctor! Very caring and professional. Answers my questions clearly. He is willing to, "go the extra mile" to help/encourage a patiient in every way possible." "What an amazing Doc. I feel great after my appointment. Dr. Poe is the most knowledged Doctor I have ever met." "It's been 6 weeks since I found this amazing doc! My 17 year old son had been constantly unwell for almost a year with recurring sinus infections at least every 10 days to 2 weeks and a general 'ugh' felling which resulted in 7weeks of missed school. Within one week Dr. Poe had his sinus passages adjusted, food intolerances tested/diet adjusted and taking nutrient supplements. He is a different kid with new found energy and he's back to his jovial self with no ill-health for the last 5 weeks!!! I would highly recommend this path for anyone with any ill-health or ailment. Advanced Kinesiology is an amazing diagnostic tool for what we put into our bodies!!! I wish everyone was aware of it!!! "I'm delighted to have met Dr. Poe and am already feeling better in just a few visits. The total body approach to wellness combined with applied kinesiology is such a beneficial combination for me personally. I highly recommend his office as they look at the whole wellness picture, not just the spine."